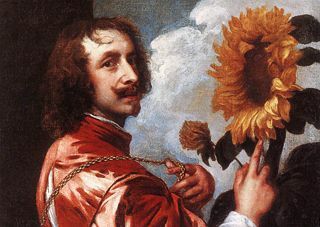 Self Portrait With a Sunflower showing the gold collar and medal Charles I gave him in 1633. The sunflower may represent the king, or royal patronage. Sir Anthony van Dyck (many variant spellings ref>Originally "van Dijck," with the "IJ" digraph, in Dutch. Anthony is the English for the Flemish Anthonis or Antoon, though Anthonie, Antonio or Anthonio were also used; in French he is often Antoine, in Italian Anthonio or Antonio. In English a capitalized "Van" in Van Dyck was more usual until recent decades (used by Waterhouse for example), and Dyke was often used during his lifetime and later</ref>), (March 22, 1599 – December 9, 1641) was a Flemish artist who became the leading court painter in England. He is most famous as a student of Peter Paul Rubens and for his portraits of Charles I of England and his family and court, painted with a relaxed elegance that was to be the dominant influence on English portrait-painting for the next 150 years. He also painted biblical and mythological subjects, displayed outstanding facility as a draftsman, and was an important innovator in watercolor and etching. Van Dyck's religious works reflect the extent which Christianity continued to impact the arts in pre-nineteenth century European culture. 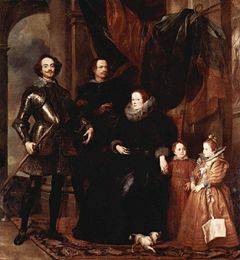 Van Dyck was born to prosperous parents in Antwerp. His talent was evident very early; he was studying painting with Hendrick van Balen by 1609, becoming an independent painter around 1615, setting up a workshop with his even younger friend Jan Brueghel the Younger. By the age of 15 he was already a highly accomplished artist, as his Self-portrait, 1613-1614, demonstrates. He was admitted to the Antwerp painters' Guild of Saint Luke as a free master by February 1618. Within a few years he was to be the chief assistant to the dominant master of Antwerp, and the whole of Northern Europe, Peter Paul Rubens, who made much use of sub-contracting artists as well as his own large workshop. His influence on the young artist was immense; Rubens referred to the 19-year-old van Dyck as "the best of my pupils." The origins and exact nature of their relationship are unclear; it has been speculated that Van Dyck was a pupil of Rubens from about 1613, as even his early work shows little trace of van Balen's style, but there is no clear evidence for this. At the same time the dominance of Rubens in the small and declining city of Antwerp probably explains why, despite his periodic returns to the city, van Dyck spent most of his career abroad. In 1620, in the Rubens' contract for the major commission for the ceiling of the Jesuit church at Antwerp (now destroyed), van Dyck is specified as one of the "discipelen" who was to execute the paintings to Rubens' designs. In 1620, at the instigation of the brother of the Duke of Buckingham, van Dyck went to England for the first time where he worked for King James I, receiving £100. It was in London in the collection of Earl of Arundel that he first saw the work of Titian, whose use of color and subtle modeling of form would prove transformational, offering a new stylistic language that would enrich the compositional lessons learned from Rubens. After about four months he returned to Flanders, but moved on in late 1621 to Italy, where he remained for six years, studying the Italian masters and beginning his career as a successful portraitist. He was already presenting himself as a figure of consequence, annoying the rather bohemian Northern artist's colony in Rome, says Bellori, by appearing with "the pomp of Xeuxis… his behavior was that of a nobleman rather than an ordinary person, and he shone in rich garments; since he was accustomed in the circle of Rubens to noblemen, and being naturally of elevated mind, and anxious to make himself distinguished, he therefore wore—as well as silks—a hat with feathers and brooches, gold chains across his chest, and was accompanied by servants." He was mostly based in Genoa, although he also travelled extensively to other cities, staying for some time in Palermo in Sicily. For the Genoese aristocracy, who were then in a final flush of prosperity, he developed a full-length portrait style, drawing on Veronese and Titian as well as Ruben's style from his own period in Genoa, where extremely tall but graceful figures look down on the viewer with great hauteur. In 1627, he went back to Antwerp where he remained for five years, painting more affable portraits which still made his Flemish patrons look as stylish as possible. A life-size group portrait of 24 City Councillors of Brussels he painted for the council-chamber was destroyed in 1695. He was evidently very charming to his patrons, and, like Rubens, well able to mix in aristocratic and court circles, which added to his ability to obtain commissions. By 1630 he was described as the court painter of the Hapsburg Governor of Flanders, the Archduchess Isabella. In this period he also produced many religious works, including large altarpieces, and began his printmaking (see below). 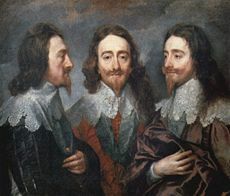 Charles I was the most passionate and generous collector of art among the English monarchs, and saw art as a way of promoting his grandiose view of the monarchy. In 1628 he bought the fabulous collection that the Gonzagas of Mantua were forced to dispose of, and he had been trying since his accession in 1625 to bring leading foreign painters to England. In 1626 he was able to persuade Orazio Gentileschi to settle in England, later to be joined by his daughter Artemesia and some of his sons. 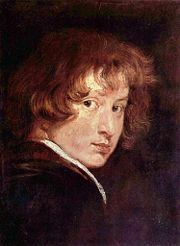 Rubens was an especial target, who eventually came on a diplomatic mission, which included painting, in 1630, and later supplied more paintings from Antwerp. He was very well treated during his nine month visit, during which he was knighted. Charles' court portraitist Daniel Mytens, was a somewhat pedestrian Fleming. Charles was extremely short (less than five foot tall) and presented challenges to a portraitist. Van Dyck had remained in touch with the English court, and had helped Charles' agents in their search for pictures. He had also sent back some of his own works, including a portrait (1623) of himself with Endymion Porter, one of Charles's agents, a mythology (Rinaldo and Armida, 1629, now Baltimore Museum of Art), and a religious work for the Queen. He had also painted Charles's sister Elizabeth of Bohemia in the Hague in 1632. In April that year, van Dyck returned to London, and was taken under the wing of the court immediately, being knighted in July and at the same time receiving a pension of £200 per year, in the grant of which he was described as principalle Paynter in ordinary to their majesties. He was well paid for paintings in addition to this, at least in theory, as Charles did not actually pay over his pension for five years, and reduced the price of many paintings. He was provided with a house on the river at Blackfriars, then just outside the City and hence avoiding the monopoly of the Painters Guild. A suite of rooms in Eltham Palace, no longer used by the Royal family, was also provided as a country retreat. 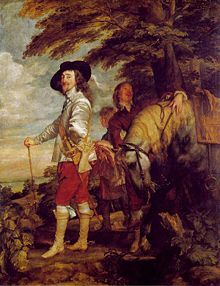 His Blackfriars studio was frequently visited by the King and Queen (later a special causeway was built to ease their access), who hardly sat for another painter whilst van Dyck lived. He was an immediate success in England, rapidly painting a large number of portraits of the King and Queen Henrietta Maria, as well as their children. Many portraits were done in several versions, to be sent as diplomatic gifts or given to supporters of the increasingly embattled king. Altogether van Dyck has been estimated to have painted forty portraits of Charles himself, as well as about thirty of the Queen, nine of Earl of Strafford and multiple ones of other courtiers. He painted many of the court, and also himself and his mistress, Margaret Lemon. In England he developed a version of his style which combined a relaxed elegance and ease with an understated authority in his subjects which was to dominate English portrait-painting to the end of the eighteenth century. Many of these portraits have a lush landscape background. His portraits of Charles on horseback updated the grandeur of Titian's Charles V, but even more effective and original is his portrait of Charles dismounted in the Louvre: "Charles is given a totally natural look of instinctive sovereignty, in a deliberately informal setting where he strolls so negligently that that he seems at first glance nature's gentleman rather than England's king." 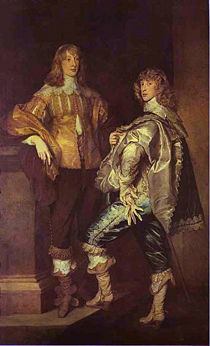 Although his portraits have created the classic idea of "Cavalier" style and dress, in fact a majority of his most important patrons in the nobility, such as Lord Wharton and the Earls of Bedford, Northumberland and Pembroke, took the Parliamentarian side in the English Civil War that broke out soon after his death. Van Dyck became a "denizen," effectively a citizen, in 1638 and married Mary, the daughter of Lord Ruthven and a Lady in waiting to the Queen, in 1639-1640; this may have been instigated by the King in an attempt to keep him in England. He had spent most of 1634 in Antwerp, returning the following year, and in 1640-1641, as the Civil War loomed, spent several months in Flanders and France. He left again in the summer of 1641, but fell seriously ill in Paris and returned hurriedly to London, where he died soon after in his house at Blackfriars. He left a daughter each by his wife and mistress, the first only ten days old. Both were provided for, and both ended up living in Flanders. Anthony returned to England, and shortly afterwards he died in London, piously rendering his spirit to God as a good Catholic, in the year 1641. He was buried in St. Paul's, to the sadness of the king and court and the universal grief of lovers of painting. For all the riches he had acquired, Anthony van Dyck left little property, having spent everything on living magnificently, more like a prince than a painter. Samson and Delilah, ca. 1630. A strenuous history painting in the manner of Rubens; the saturated use of color reveals van Dyck's study of Titian. With the partial exception of Holbein, van Dyck and his exact contemporary Diego Velasquez were the first painters of pre-eminent talent to work mainly as Court portraitists. The slightly younger Rembrandt was also to work mainly as a portraitist for a period. In the contemporary theory of the Hierarchy of genres portrait-painting came well below History painting (which covered religious scenes also), and for most major painters portraits were a relatively small part of their output, in terms of the time spent on them (being small, they might be numerous in absolute terms). Rubens for example mostly painted portraits only of his immediate circle, but though he worked for most of the courts of Europe, he avoided exclusive attachment to any of them. A variety of factors meant that in the seventeenth century demand for portraits was stronger than for other types of work. Van Dyck tried to persuade Charles to commission him to do a large-scale series of works on the history of the Order of the Garter for the Banqueting House, Whitehall, for which Rubens had earlier done the huge ceiling paintings (sending them from Antwerp). A sketch for one wall remains, but by 1638 Charles was too short of money to proceed. This was a problem Velasquez did not have, but equally, van Dyck's daily life was not encumbered by trivial court duties as Velasquez's was. During his visits to Paris in his last years, van Dyck tried to obtain the commission to paint the Grande Gallerie of the Louvre without success. A list of history paintings produced by van Dyck in England survives, by Bellori, based on information by Sir Kenelm Digby; none of these still appear to survive, although the Eros and Psyche done for the King (below) does. But many other works, rather more religious than mythological, do survive, and though they are very fine, they do not reach the heights of Velasquez's history paintings. Earlier ones remain very much within the style of Rubens, although some of his Sicilian works are interestingly individual. Van Dyck's portraits certainly flattered more than Velasquez's; when Sophia, later Electoress of Hanover, first met Queen Henrietta Maria, in exile in Holland in 1641, she wrote: "Van Dyck's handsome portraits had given me so fine an idea of the beauty of all English ladies, that I was surprised to find that the Queen, who looked so fine in painting, was a small woman raised up on her chair, with long skinny arms and teeth like defence works projecting from her mouth…." Some critics have blamed van Dyck for diverting a nascent tougher English portrait tradition, of painters such as William Dobson, Robert Walker and Issac Fuller into what certainly became elegant blandness in the hands of many of van Dyck's successors, like Lely or Kneller. The conventional view has always been more favorable: "When Van Dyck came hither he brought Face-Painting to us; ever since which time … England has excel'd all the World in that great Branch of the Art’ (Jonathan Richardson. An Essay on the Theory of Painting, 1715, 41). Thomas Gainsborough is reported to have said on his deathbed "We are all going to heaven, and Van Dyck is of the Company." A fairly small number of landscape pen and wash drawings or watercolors made in England played an important part in introducing the Flemish watercolor landscape tradition to England. Some are studies, which reappear in the background of paintings, but many are signed and dated and were probably regarded as finished works to be given as presents. Several of the most detailed are of Rye, a port for ships to the Continent, suggesting that van Dyck did them casually whilst waiting for wind or tide to improve. Probably during his period in Antwerp after his return from Italy, van Dyck began his Iconography, eventually a very large series of prints with half-length portraits of eminent contemporaries. Van Dyck produced drawings, and for eighteen of the portraits he himself etched with great brilliance the heads and the main outlines of the figure, for an engraver to work up: "Portrait etching had scarcely had an existence before his time, and in his work it suddenly appears at the highest point ever reached in the art"
However for most of the series he left the whole printmaking work to specialists, who mostly engraved everything after his drawings. His own etched plates appear not to have been published commercially until after his death, and early states are very rare. Most of his plates were printed after only his work had been done; some exist in further states after engraving had been added, sometimes obscuring his etching. He continued to add to the series until at least his departure for England, and presumably added Inigo Jones whilst in London. The series was a great success, but was his only venture into printmaking; portraiture probably paid better, and he was constantly in demand. At his death there were 80 plates by others, of which 52 were of artists, as well as his own 18. The plates were bought by a publisher; with the plates reworked periodically as they wore out they continued to be printed for centuries, and the series added to, so that it reached over two hundred portraits by the late eighteenth century. In 1851 the plates were bought by the Calcographie du Louvre. The Iconography was highly influential as a commercial model for reproductive printmaking; now forgotten series of portrait prints were enormously popular until the advent of photography. 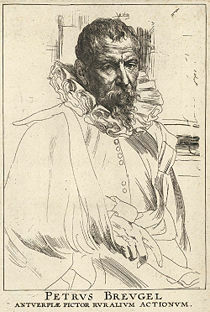 Van Dyck's brilliant etching style, which depended on open lines and dots, was in marked contrast to that of the other great portraitist in prints of period, Rembrandt, and had little influence until the 19th century, when it had a great influence on artists such as Whistler in the last major phase of portrait etching. Hyatt Mayor wrote: "Etchers have studied Van Dyck ever since, for they can hope to approximate his brilliant directness, whereas nobody can hope to approach the complexity of Rembrandt's portraits"
His great success compelled van Dyck to maintain a large workshop in London, a studio which was to become "virtually a production line for portraits." According to a visitor to his studio he usually only made a drawing on paper, which was then enlarged onto canvas by an assistant; he then painted the head himself. In his last years these studio collaborations accounted for some decline in the quality of work. In addition many copies untouched by him, or virtually so, were produced by the workshop, as well as by professional copyists and later painters; the number of paintings ascribed to him had by the nineteenth century become huge, as with Rembrandt, Titian and others. However most of his assistants and copyists could not approach the refinement of his manner, so compared to many masters consensus among art historians on attributions to him is usually relatively easy to reach, and museum labeling is now mostly updated (country house attributions may be more dubious in some cases). The relatively few names of his assistants that are known are Dutch or Flemish; he probably preferred to use trained Flemings, as no English equivalent training yet existed. Adiaen Hanneman (1604-71) returned to his native Hague in 1638 to become the leading portraitist there. 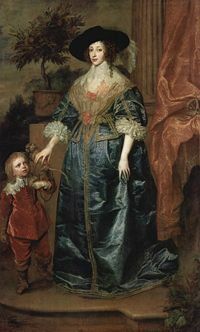 Van Dyck's enormous influence of English art does not come from a tradition handed down through his pupils; in fact it is not possible to document a connection to his studio for any English painter of any significance. Van Dyck painted many portraits of men, notably Charles I and himself, with the short, pointed beards then in fashion; consequently this particular kind of beard was much later (probably first in America in the nineteenth century) named a vandyke (which is the anglicized version of his name). During the reign of George III, a generic "Cavalier" fancy-dress costume called a Van Dyke was popular; Gainsborough's 'Blue Boy' is wearing such a Van Dyke outfit. The oil paint pigment van Dyck brown is named after him , and Van dyke brown is an early photographic printing process using the same color. See also several people and places under Van Dyke, the more common form in English of the same original name. Most major museum collections include at least one Van Dyck, but easily the most outstanding collection is the Royal Collection, which still contains many of his paintings of the Royal Family. The National Gallery, London (14 works), The National Gallery of Art in Washington DC and the Frick Collection in New York City have splendid examples of all phases of his portrait style. ↑ Christopher Brown. Van Dyck 1599-1641. (Royal Academy Publications, 1999. ISBN 0900946660), 15. ↑ Brown, 33. In 1666 the Great Fire of London destroyed Old Saint Paul's Cathedral, and with it van Dyck's tomb. Becker, D.P. and K.L. Spangeberg, ed. Six Centuries of Master Prints. Cincinnati Art Museum, 1993. no 72, ISBN 0931537150. Gaunt, William. Court Painting in England from Tudor to Victorian Times. Academic Press Canada Ltd. 1980. ISBN 0094618704. Hind, Arthur M. A History of Engraving and Etching. (original 1923) reprinted Mineola, NY: Dover Publications, 1963. ISBN 0486209547. Levey, Michael. Painting at court. New York University Press, 1971. ISBN 081474950X. Martin, Gregory. The Flemish School, 1600-1900. London: National Gallery Catalogs. National Gallery, 1970. ISBN 0901791024. Mayor, A Hyatt. Prints and People. Metropolitan Museum of Art. Princeton University Press, 1971. no. 433-435, ISBN 0691003262. Royalton-Kisch, Martin. The Light of Nature, Landscape Drawings and Watercolours by Van Dyck and his contemporaries. London: British Museum Press, 1999, ISBN 0714126217. Spangeberg, Kristin L. ed., Six Centuries of Master Prints. Cincinnati Art Museum, 1993, no 72, ISBN 0931537150. Waterhouse, Ellis. Painting in Britain, 1530-1790, 4th Ed. Penguin Books 1978. (now Yale History of Art series). ISBN 0300058330. History of "Anthony van Dyck"
This page was last modified on 4 April 2016, at 14:17.